111. Where will you write your business logic? 112. What will vo.createRow() do? createRow creates a row in the VO. 113. How do you catch the button event on ProcessFormRequest Method? Here update1 is the event. 114. What is pageButton bar? When you want to display buttons on top and bottom of the page then you create a region as pageButtonbar and create buttons within this region. 115. How do you add a link to OAF Page? Create a new item with style as link and give its destination uri property which is the url where you want to navigate to. 116. Which is the top most region in OAF page? 117. 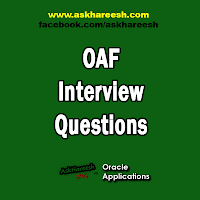 What are all the several ways to debug an OAF based application? We can use the debugger option .Set breakpoints and run the page in debug mode. 118. How do you call an pl/sql api from OAF page? 119. Should a search page have an EO? 120. What will happen when you set DisableClientSideValidation property to True? If you set the property to True it shows that there will no validation that will occur on the web tier as part of the form submit.